Who says that recess has to be just for kids? Studies have shown that enjoying more time outdoors can boost your ability to solve problems and increase creativity, and that applies to all ages! 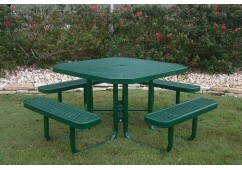 Whether it’s for your school playground, apartment complex, or business park, an industrial picnic table is a great way to encourage people to spend more time outside, providing children and adults with an inviting place to play games, eat, work on projects, or just sit and take in the sights and sounds of the outdoors. Give visitors a place to enjoy a delicious meal under a tree, a meeting in fresh air for a change of pace, or even lunch in an open-air food court with these outdoor commercial picnic tables! The ever-popular picnic table can actually be a multi-use table depending on design. Each type of material has its own advantages that makes it ideal for specific situations and locations. Flat-top tables are better for writing, for instance, whereas ribbed steel is better for eating. 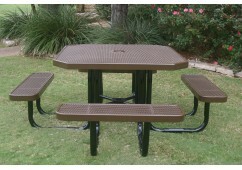 Choose from a large selection of durable tables with steel or recycled plastic construction. When browsing our products, click on an image to view more information about the product, including color and size options. Whether you’re looking for bench seating, circular tables, or a traditional picnic table design, we have a wide variety of school picnic tables and commercial picnic benches to choose from. We realize that safety and durability are very important for outdoor equipment, especially in our school picnic tables for children and toddlers. That’s why all of the commercial picnic tables we carry feature only top-quality materials that come in a variety of styles, sizes, and shapes! Our tables are also coated in a protective layer of thermoplastic, which keeps metals from corroding so you can enjoy these products for years to come! We also offer a wide selection of colors to make sure that your vision becomes reality. The majority of our school picnic tables are available for quick shipping, and professional installation is also available. Contact us now for a free quote on one of our in-stock products or a custom creation of your own!